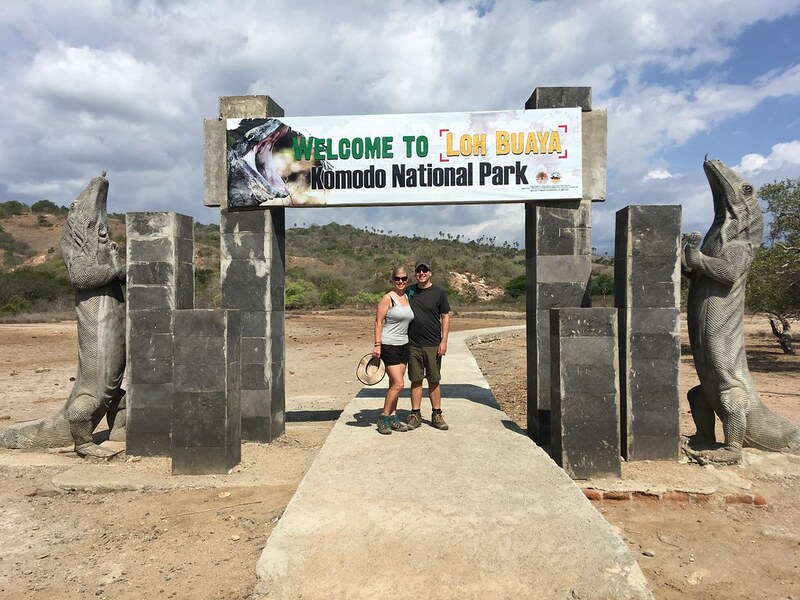 When Pete and I decided to spend a couple of weeks exploring Indonesia, the number one area I wanted to visit was Komodo national park. Renowned the world over for its famous, dragon-like residents, the park also has the most astonishing natural beauty. So we booked space on a boat so that we could spend three days bobbing around this corner of the world and uncover some of its treasures. Today's post is just about the setting off, but there is much more to follow! 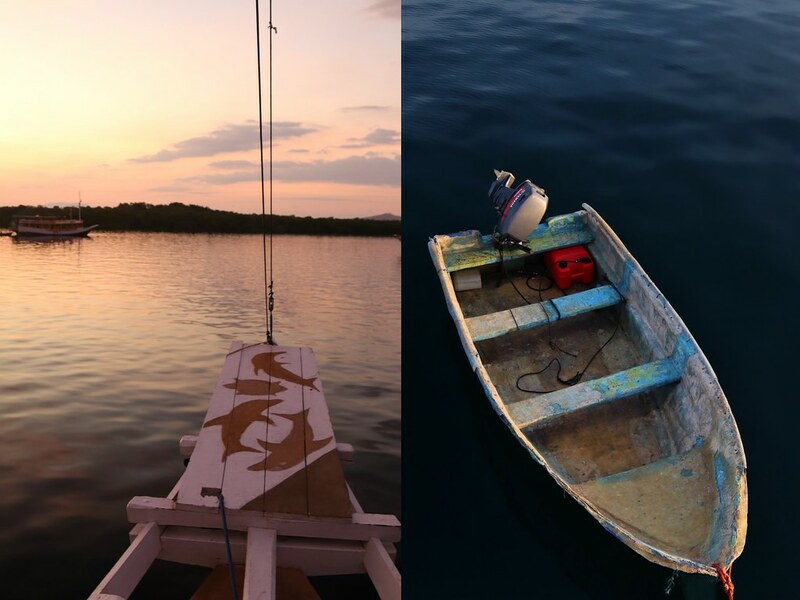 And you can find some of our other Indonesian Adventures linked here. And once again, after two days of civilised getting up time, the alarm jangled at 4:00am. We hauled out of bed, packed up our things and jumped a cab to the airport. We speedily checked in and then devoured a Starbucks as I really needed a good cup of tea. And a raisin oatmeal scone and some banana cake because sometimes it’s hard to know when to stop. We boarded our flight without incident this time - hurrah! - and had not only landed but also managed to collect our bags and leave the airport by 9:05 which is when we were scheduled to land. A couple of moments later, our guide for the next couple of days appeared and introduced himself. 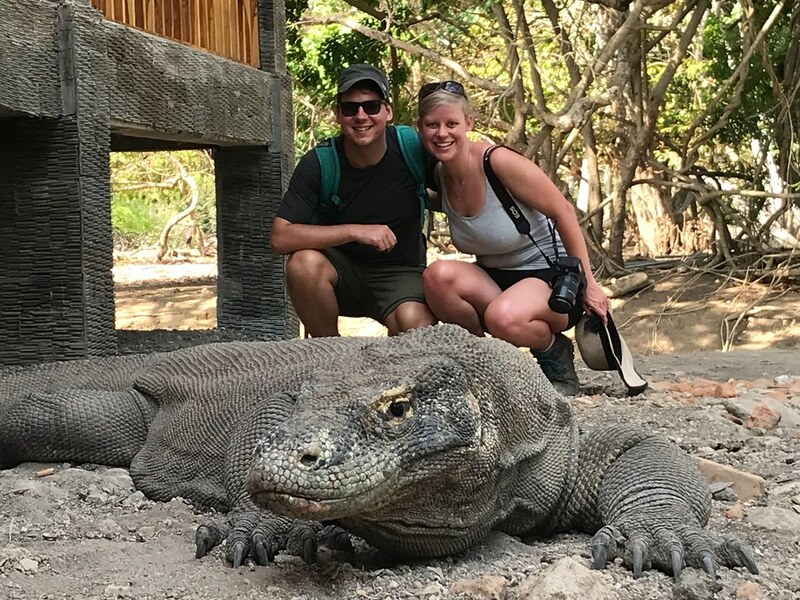 Alex, from Top Komodo Tours. 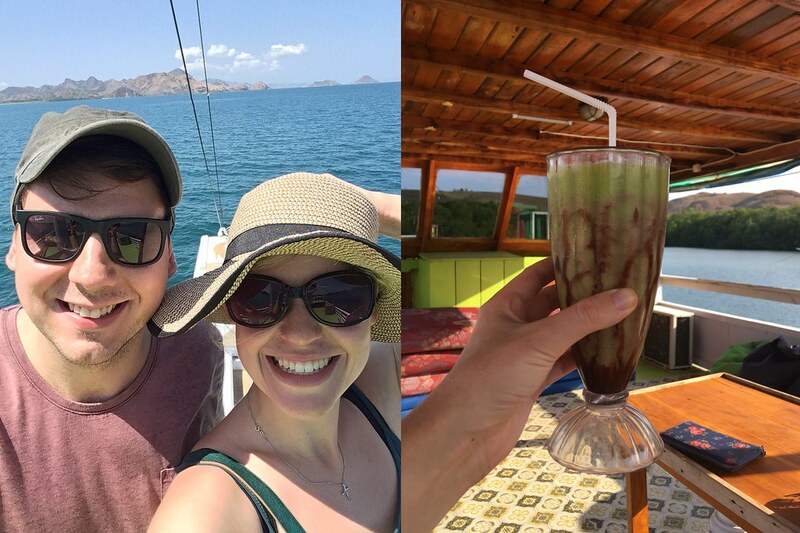 Because if you’re going to tour Komodo, you may as well do a Top tour, obvs. We drove us down to the boat, stopping en route for us to pick up a couple of beers and a coke or two (Pete loves his coke) and found our little floating home waiting. Except that it was big! We boarded on the top deck, scrambling in off the jetty, and we were given a quick tour. At the top there was a shaded deck with benches and a table for our meals, along with a front sun deck complete with two chairs for chilling. Shimmying down a ladder we reached the lower deck which had our cabin: a little wooden affair with double top and bottom bunks. We stashed our bags underneath and figured we could sleep on top. The loo was also on this deck, which was flushed with a scoop and a barrel of seawater, and there was a shower mounted on the wall as well. Finally, there was a little galley kitchen at the back. It was all very compact, wooden, and basic but with a rustic charm that appealed. The top deck was painted an eye-catching lime green and details were picked out in blue and white. And with that, we were ready to set sail, a little boat bobbing along in our wake to take us to shore when needed. We settled in on the upper shady deck, slouching on the benches into beanbags. Lovely! The sea breeze was the best air con you could ask for: fresh but slightly warm and we could see little islands popping up here and there out of the ocean. We were ready to explore Komodo national park. Our first stop of the day was snorkelling; we moored near a beach off Kelor island, donned fins and masks and plopped off the side into the water. It wasn’t too cold and we swam for the beach; the water was quite deep and a little murky so it was a while before we could see anything. But then the seabed loomed into view along with the odd scruffy patch of coral and pack of fish and we pootled about in the bay for the best part of an hour. Pete spotted the most interesting feature: a long snake-like creature which I would have said was a massive snake except for the fact that it was coiled up under the sea. It was moving slightly and we hovered over it at the surface, watching intently. With our first snorkel forray finished, we climbed back onto the good ship what’s-her-name and sailed on. By sailed I mean motored on with a 4 cylinder engine. We reached another snorkelling spot, called Menjerite and repeated the procedure, toppling in off the boat and going for a swimmy swim. The difference was quite astonishing: coral absolutely plastered the bay, often only inches below us. The variety was enormous and there were hundreds upon hundreds of fish bobbing about. I have no idea what they all were, but I recognised some from diving. We definitely spotted an angelfish or two, and I also found a Clown Fish hiding in its coral. Equally possibly, I found a False Clown Anemone Fish. So hard to tell! Swarms of fish were everywhere from the fairly chunky to the teeny tiny and I swam about after them like a gleeful toddler, hoping one of them might come within my grasp. Not that I would have grabbed one, obviously. It felt more than ever like swimming around in a big tropical aquarium; a little bit unreal to see everything that was going on just below the surface. Such a shame that the GoPro had packed in. We climbed out of the sea again and were pretty keen to take up the offer of lunch. When I emerged back onto the top deck, I was surprised by the enormous spread we found: noodles, rice, a prawn salad, veg in coconut sauce, satay prawns, little soy bean fritters and a fish dish cooked in a tasty red sauce. Oh, and melon to finish off. There was enough food for six, and we tucked in as best we could, putting away 2 platefuls each, but even with Alex having lunch as well, we weren’t close to finishing it all. 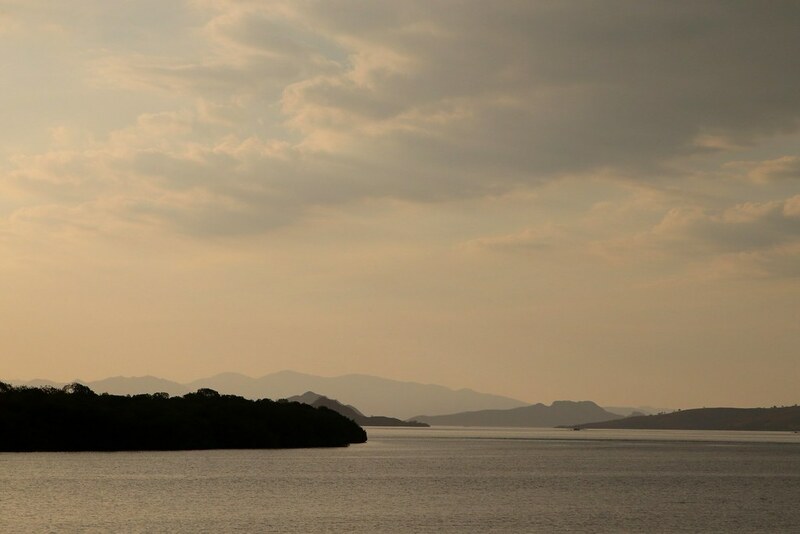 It was an hour or so by boat to Rinca, the island that would be our next stop. I propped myself up on a beanbag against the bench, Pete propped himself up on a beanbag against me and we both dozed, enjoying the sea sliding past, the warm air and the cool breeze. Rinca seemed to roll around in no time, and we jumped up to change into hiking gear. That was when I discovered that despite two applications of the factor 50, my back, shoulders and the backs of my legs were pretty burnt. Slightly painfully burnt. Sigh. I put on an extra thick layer of suncream for our hike and we took our little dingy over to the jetty. 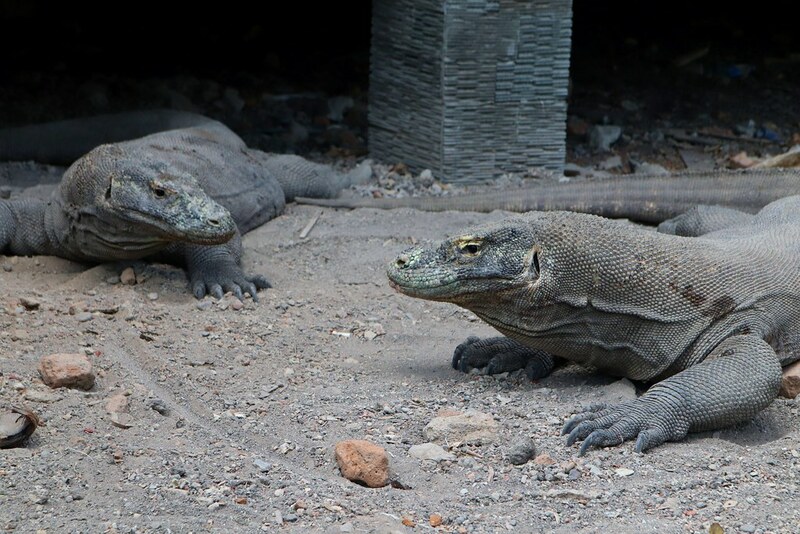 We finally emerged onto land: land that was home to Komodo dragons. Alex led us to the visitor centre for the island, snapping a picture of us at the gates on the way, and found us a guide to take us on the “medium trek” around the island. Our naturalist guide was a cheerful soul and he led us off to a small building. The building was raised up on concrete blocks to avoid the attention of Komodos. And fair enough as slumbering underneath were about half a dozen dragons. They were big, some male, some female, but all sleepy with the heat. It was intensely warm, and while not as humid as it has been on some days, you could see why they just wanted to slump in the shade. 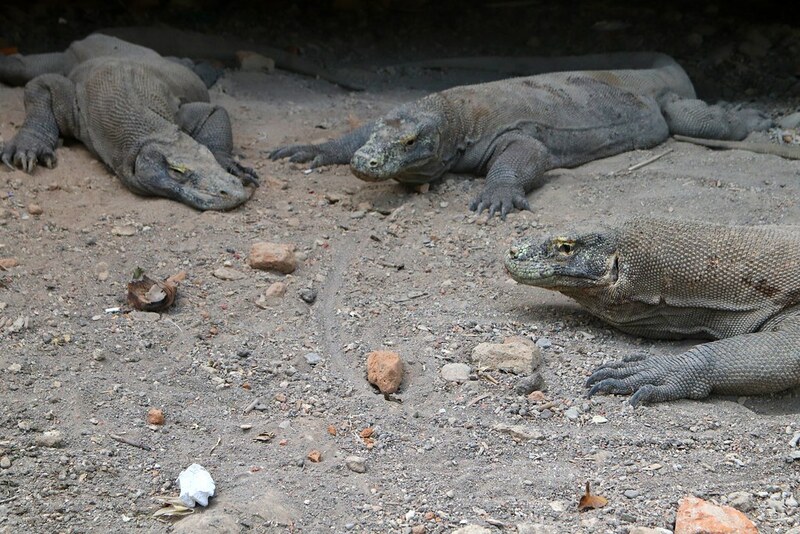 They were grey and scaly with huge claws and they watched in every direction at once, the occasional flicker of an eyelid indicating that they were alert. Our guide said they need it to be the right temperature: not too hot and not too cold, so they are pretty inactive during the day, hunting out shade to lie in. And a good job too as they can run at 20km/h when so inclined, have horrifically poisonous bites and they eat every part of their prey, bones and all, like snakes. Apparently this makes their droppings chalky, because of all the calcium. Crazy. We had to keep at least 2m away from the dragons - happy to - and all the guides carry long staffs with a fork at the end, which apparently can fend off Komodos as it’s like their tongues. I would rather he didn’t have to put it to use. 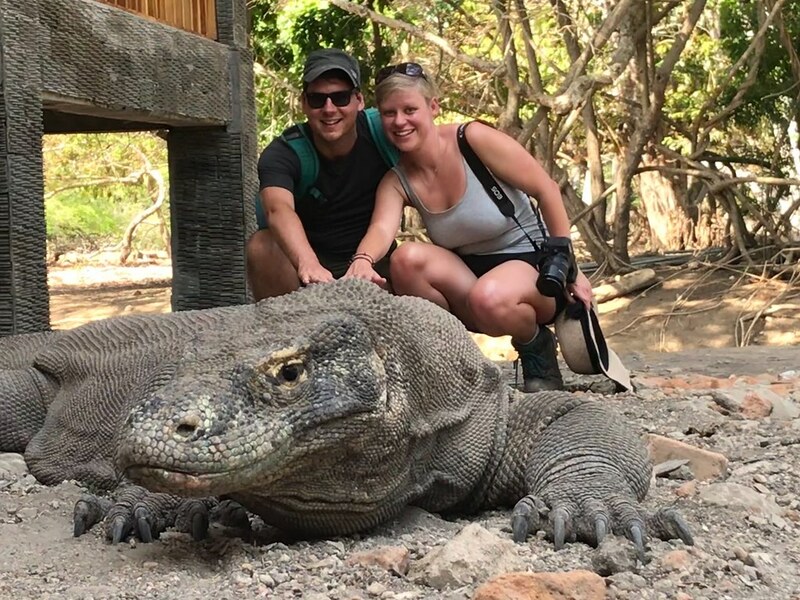 The guide did take some fab photos of us with the dragons though, and I think that will be the one that goes on the cover of my wildlife explorer book. Before I get my nature documentary deal with the BBC. 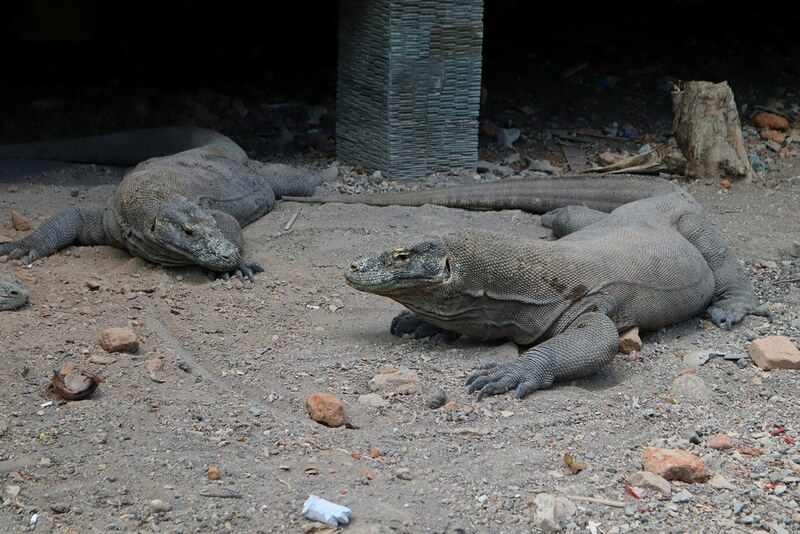 We trekked around the island, coming across a nesting site with a Komodo dragon sprawled across it. They lay about 30 eggs in a clutch, and the clutch then sits in a hole for 7 months. About half of them will hatch, at which point Mum and Dad set about cannibalising their offspring. I know it’s not nice to judge, but that is plain poor parenting. And what a waste of all the effort of producing and watching the eggs. The juveniles that actually hatch and don’t get eaten have the good sense to scarper up into the trees and stay there until they’re big enough to come down, and meanwhile they eat eggs and birds and whatever else they can find in the trees. Until they’re big enough to return to the ground, fall in love and have children of their own to eat. Weirdos. But huge, fascinating, terrifying, beautiful weirdos. The rest of the trek took us past a watering hole, where the dragons lie in wait to track down water buffalo and deer. The former in particular are massive and if the Komodos can bite them, the poison will seep into their system, slowing them down until they die. Giant meal: the dragons only need to eat a couple of times a month. A nicely macabre selection of leftover skulls was nailed to one of the trees we passed and we emerged into scrubby brushland, scaling a small hill. 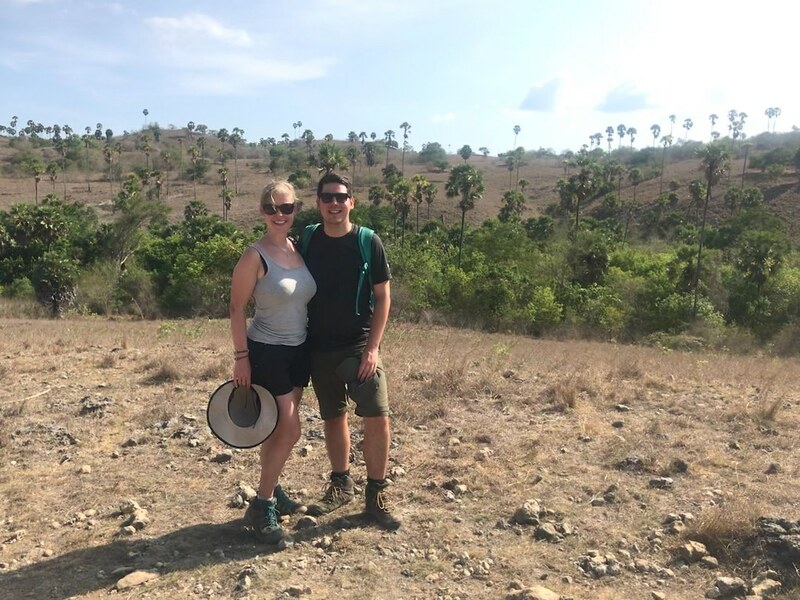 The views over Rinca were lovely, with the odd palm decorating the rolling hills. The landscape was quite yellow and dry, which was a contrast from the lush humidity we have seen elsewhere on this trip. We spotted a water buffalo - “he is big, just like me!” Commented our guide. This was his favourite joke as he told it several times and always chuckled to himself, but as he was so good humoured, his laughter was quite infectious. We also saw deer, bush turkeys being very busy in the undergrowth and quite a lot of monkeys roaming about. There was really quite a lot of wildlife. Our trek ended after about an hour, and while it had been short and mostly flat, the heat had made us go through all our water and really start to sweat. It was nice to get back to our boat and dive into the shade. And waiting for us was an avocado smoothie each, with a swirl of chocolate sauce. A slightly strange combo but cool and refreshing and filling. We were clearly not going to go hungry for the next few days. We chilled out, had a cuppa, and I did some travel journal, and then an afternoon snack appeared. The snack turned out to be potato fritters, deep fried in some sort of batter, topped with cheese. A very strange combination. The fritters were great if you ignored the chocolate, but it was definitely an unusual one. P.S. 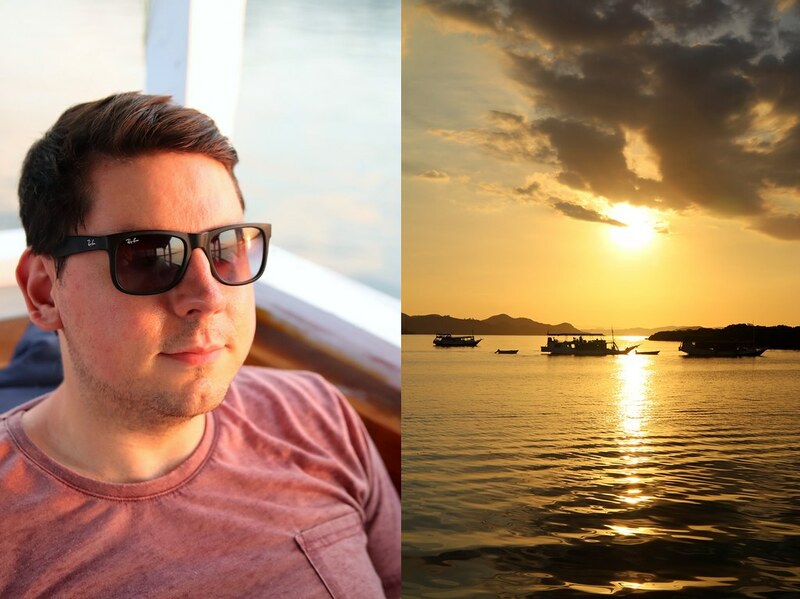 You can find other stories of our time in Indonesia linked here: Indonesian Adventures.